April's Little Family: Speechless Sunday. So, apparently Face doesn't think diapers are necessary for choo-choo play. Sweet. I told him no diaper means he's a big boy and can use the potty. Heh. He jumped off the john like it was laden with hot coals. I'm thinking toilet training will be a blast. I probably have a similar pic of my now 3-y/o nudist. lol. He would occasionally go potty before bathtimes, if so inclined, but we waited 'til the more standard age for boys to give it a sincere shot...not easy when someone else is in charge half the day and dropping the ball, but at 3, he just did it on his own. Good luck. My first tried to will his potty away due to not wanting to stop having fun for something as annoying as going potty, and my second, a girl, just up and was potty trained at 18 months - depends on the kid IMO. Maybe if you put trains by the potty the issue would magically resolve itself. I wouldn't get my hopes up if I were you though. EVERYONE knows that you don't play trains with pants on! didn't you see that episode when thomas smashed into the bathroom? just be grateful there weren't any "surprises" in that diaper for you. that is hilarious!!!! Good luck! I love your blog's new look! Oh LOL! The cleverly placed leaves are cracking me up! So funny and sweet. Playing is always more fun without a diaper! I have a nudist too! i love how delicately it was cast aside, all "hmm. i'll need this later. for dinner - just not trains, obvs." You enjoy that potty training. Remember I'm here for ya when you need me! LOL. 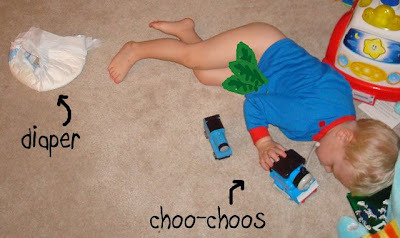 Love the leaves in front of his choo choo. Hah. He can already take his diaper off? You could be in trouble! Or maybe he'll potty train himself. How sweet would that be? Does that happen?